Dashy Crashy is a fun and flashy iOS game, but will it last? This lane-swapping endless driver amuses and has a rather reasonable business model, but that might not be enough. It’s always a nice change of pace to dig into a free-to-play that doesn’t seem like its original spark of existence was, “You know, we could make a lot of money if [game idea here].” After playing Candy Crush Jelly Saga and Katy Perry Pop for the last two of these columns, I hoped to end up with something fun and fresh, and not hopelessly vapid or purposefully misbalanced. So thank you, Dashy Crashy, for being you. Maybe it’s not the next Crossy Road-sized freemium phenom, but it’s thoroughly solid, alluringly vibrant, and thankfully very straightforward and fair in its business model. 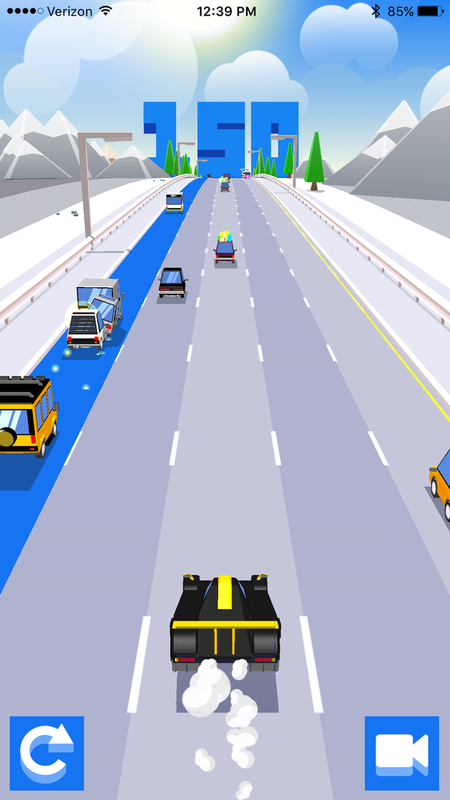 But the more I played this endless driver, swiping to avoid collisions with my boxy ride, I quickly started to wonder: Is there enough here to keep me coming back? Or to convince me to spend money, even? Emoji pop up from time to time to show you how other drivers are feeling. Guess this cop isn’t digging the situation immediately in front of him. Dumpling Design’s Dashy Crashy is effectively a behind-the-back endless runner, only instead of commanding a daring adventurer or a train-hopping brat, you’re driving a car on the highway—and across five lines instead of the usual three seen in many runners. Also, there’s no jumping or sliding, or even coins or power-ups to collect: All you’re doing is trying to drive as far as you can without smashing into the other cars around you. That’s initially pretty easy. Cars signal before they switch lanes and take their time, so there’s never really a surprise from some dimwitted driver. Every so often there’s a couple-car crash, but it’s rarely a big problem. Things start getting a little trickier once your distance tally hits triple-digits and you run into events: Maybe there are a few big pile-ups in quick succession, or a series of lane-changing logging trucks clogging up the road. Big pileups sometimes happen in quick succession, and you don’t want to be driving into something that has both flames and poop. But things don’t really get challenging (well, frustrating) until cars start coming from behind. A lane will light up, and that’s your cue that someone is speeding up from the rear—quickly, one or more cars will zip into view and inevitably cause crashes right in front of you, which send other cars flying all over and frequently into your lane. Even if I swipe down to slow my ride and try to avoid the crashes, this is almost always when my game ends. It feels super cheap. And it’s the exact reason why you use a heavier ride—like a Lorry or Bus—that can absorb a couple hits before tanking, rather than a Taxi or Family Wagon that’s sure to go bust with a single tap from any other vehicle. 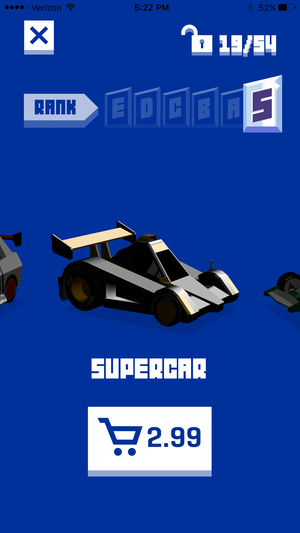 Dashy Crashy’s vehicle selection recalls the character roster of Crossy Road, with many cars awarded free over time but always available to purchase right away (if desired), and naturally it’s where Dashy Crashy makes its money. You can buy cars that haven’t yet unlocked for free, although similarly-sized rides seem nearly identical in my testing. Rather than earn coins for a random character draw (like in Crossy Road), here you receive new cars as gifts for completing tasks—passing a certain distance threshold, for example, or toppling a friend on your leaderboard. In that sense, there’s an added air of accomplishment, especially when you see your pal’s Game Center icon fall into the distance as you zoom past his or her top score. 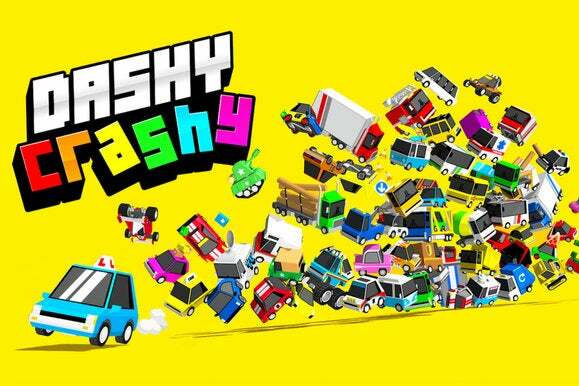 In its initial freemium state, Dashy Crashy can be played six times before a video ad rolls. Watch the commercial (always for another mobile game, in my experience) and you get another six play attempts. Lives don’t regenerate here, like they do in most free-to-play games, but I find the system totally fair: If you don’t want to pay money, you essentially swap 20 to 30 seconds of your time to get another 10-or-so minutes of gameplay. I’ll take that trade any day. Look out! The highlighted lane means aggressive drivers are coming up quickly. But if you buy any car in the game with real money, whether it’s a D-rank RV for $1 or an S-rank UFO or Tank for $3 apiece, the ads are gone forever and you unlock unlimited play. Again, that’s a totally fair system for a game you might conceivably play hundreds of times. Either watch a short commercial—fully anticipated and manually triggered, I might add—every so often, or drop a buck and you’re set forever. It’s a model that could make a lot of exhaustingly monetized games a lot more enjoyable. Problem is, I don’t notice a difference between vehicles of the same general type beyond the cosmetics. 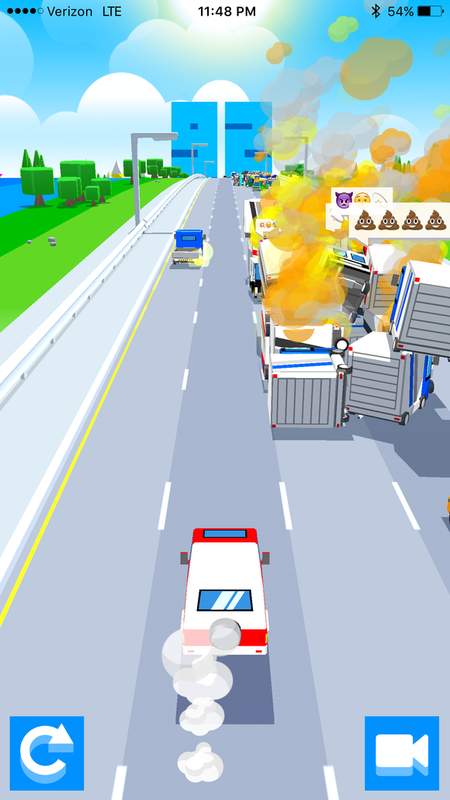 Big trucks are more durable but sluggish, while small cars are zippy and flimsy, but the free Garbage Truck that I unlocked doesn’t really seem different from the Monster Truck I paid $3 for. I bought a few of the higher-end, S-rank cars to see how they changed or enhanced the game, and came away scratching my head. I hoped there’d be something different aside from look, but if there is, I’m just not seeing it. It’s part of the reason why Dashy Crashy strikes me as a short-term diversion instead of a long-lasting mobile favorite, at least in its current incarnation. I longed for a sense of variety or progression as my time with it added up, but after a few dozen attempts and $8-9 spent on what are supposedly the best cars, I really felt like I’d seen it all. And that’s discouraging. 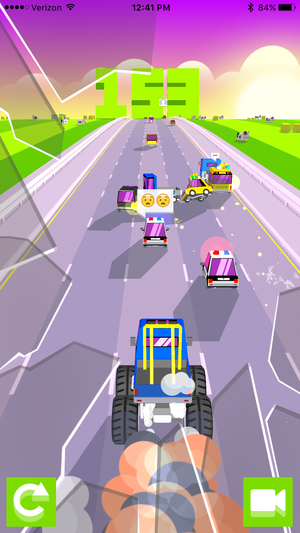 That said, Dashy Crashy is a fun pick for a quick, amusing download, and there’s certainly loads of room here to build on the premise and offer incentive for continued play—whether it’s missions, visual variety, or more differentiation between vehicles. The freemium model is great, as is the look and pick-up-and-play appeal, but now it’s time for Dumpling to build upon that. I eagerly await the results.